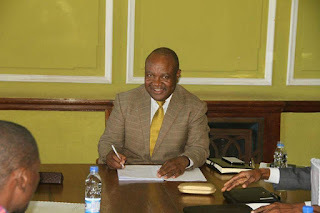 Harare City Council yesterday resolved to send names of three successful candidates for the position of town clerk to the Local Government Board (LGB) for consideration. The three are Engineer Hosiah Chisango who scored 1 052 points, former Zimbabwe Revenue Authority (Zimra) finance director Mr Robert Mangwiro 903 points and a University of Zimbabwe lecturer Mr Eugine Makaya who managed 852 points. A special council meeting held yesterday resolved to forward the name of Mr Mangwiro despite that he was dismissed by Zimra after being found guilty of 21 counts of misconduct in 2016. Mr Mangwiro challenged the dismissal at the Labour Court, claiming the conviction was made in error, but the disciplinary committee maintained that a dismissal was appropriate in light of the conviction. Harare Mayor Councillor Bernard Manyenyeni said council had resolved that Mr Mangwiro’s name should be forwarded on the principle that everyone is considered innocent until proven guilty. “We met as council to receive the recommendations of the Human Resources and General Purposes Committee on the interviewing process for the next Town Clerk for the City of Harare,” he said. “The recommendations were acceptable after a lot of debate. As you appreciate, there are indications that in the public space there are challenges facing one of the aspirants for the position. During council’s debate on Mr Mangwiro’s case, acting chamber secretary Mr Charles Kandemiri said council had the legal right to vary, alter or reject the recommendations from the human resources committee. He said in terms of the Urban Council’s Act, it did not specify the number of candidates that council should refer to the LGB. “If council is convinced that candidate number two has some misconduct it is not pleased about, council has the power to remove him,” said Mr Kandemiri. Harare has failed to fill the position over 30 months owing to various reasons with the latest attempt seeing a consultant going through over 127 applications, with only 11 candidates being shortlisted for the position. The post fell vacant in 2014 after Dr Tendai Mahachi’s retirement. In 2016, council appointed former banker Mr James Mushore to the post of town clerk, but just a few hours after council announced his appointment, Government rescinded the decision because the local authority flouted procedures of appointment as laid out in the Urban Councils Act. Council then conducted fresh interviews, where top MDC-T official and former Cabinet minister Dr Tapiwa Mashakada came up tops, but the Local Government Board did not approve the three short-listed candidates.